It’s already early June and the Canary Islands haven’t had enough rains. The earth is finding it difficult to be generous, even in these times of economic hardship. Life is bleak for those people forced by the financial crisis into rediscovering the art of getting an abandoned and parched plot of land provide a sack of potatoes. 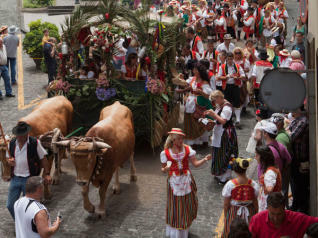 And yet on the island of Tenerife they will still dress up in their finest costumes on 9th June, tune up their musical instruments, decorate their old carts and come to the romería in La Orotava to share what little produce they have, with friends and strangers alike. Thank God for tradition, glorious, old-fashioned, joyous tradition! 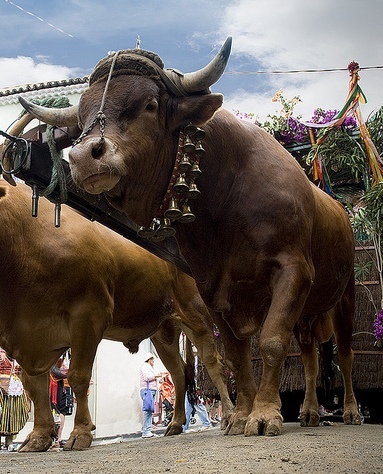 Like so many traditions of this kind, a romería has its origins in a form of religious pilgrimage. The word romero is thought to mean “those travelling to Rome” in ancient times. Historians refer to it as a Catholic celebration consisting of a peregrination from the fields and country villages to a sanctuary or hermitage. The original idea behind these pilgrimages was to keep a promise to thank and venerate a particular saint in return for a favour asked for in prayer. Tenerife’s romerías, the most famous being those held in the towns of La Orotava, Garachico, Tegueste and Guimar, sometimes last for a whole day. But the best known in Spain is in Huelva, where the faithful often take a number of days to make their way to the sanctuary of La Virgen del Rocío. 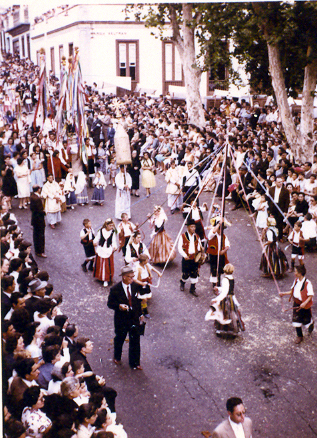 The romería in La Orotava is known as La Romería de San Isidro Labrador. Historians believe it was first introduced by the Mayor, Ascanio-Bazán y Molina, who was born in La Orotava in 1799. He happened to be in Madrid in the middle of May one year and witnessed the capital’s own San Isidro pilgrimage celebrations. When he returned to the island he organised his own pilgrimage and funded it out of his own pocket before handing the idea and duty over for the town council to organise in the future. 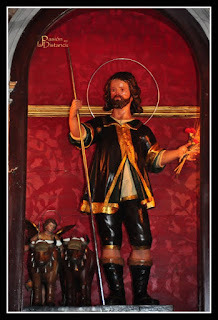 Although La Orotava’s San Isidro romería, in its present form, began to take shape in 1936, just before the outbreak of the Spanish Civil War, the first recorded pilgrim’s procession through the old town has been traced to 1846. 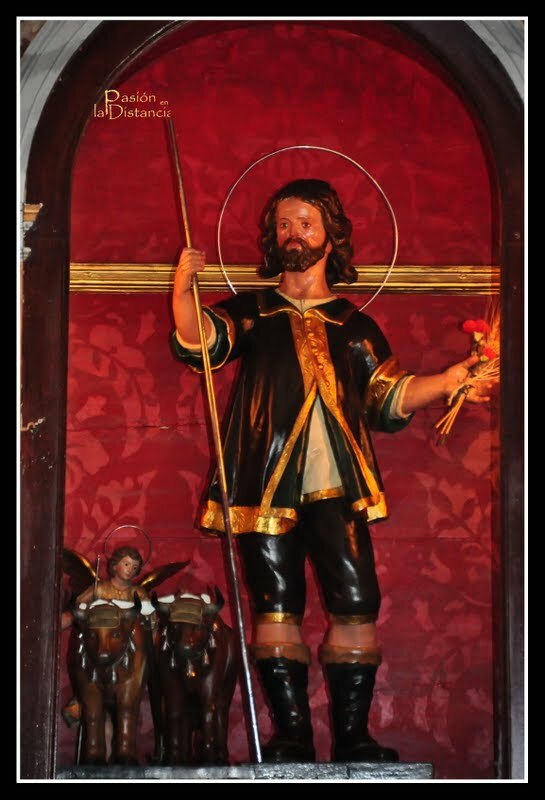 Originally, on the Saturday morning, they simply carried an effigy of the saint, San Isidro, from the sanctuary of El Calvario as far as the San Agustín church. The priest would bless the cattle before they returned back to El Calvario in happy procession. Indeed, religious respect was never an impediment for having fun and socialising. There was always much singing, dancing, colour and quite a lot of wine-drinking. 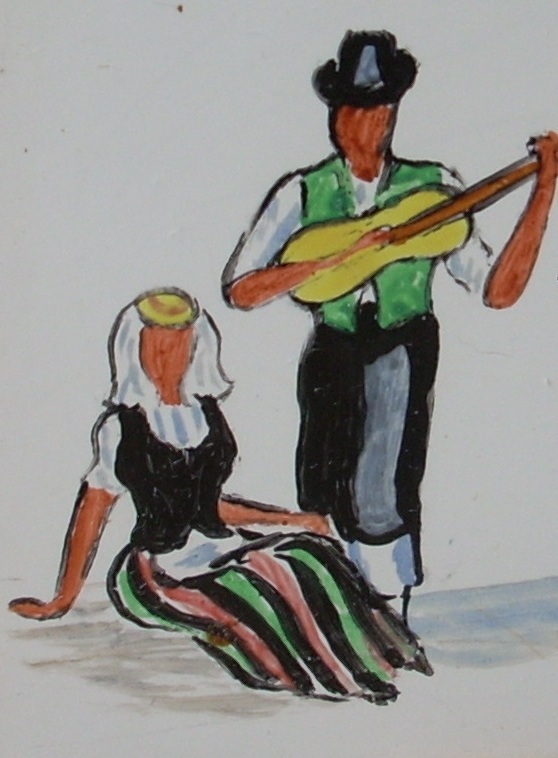 It was even an opportunity, like this pair of romeros painted on a simple piece of pottery by Violet Brook-Watson in the 1960's, to do some old-fashioned courting. In the 1950s a recently arrived family from Devonshire were thrilled by the romería in La Orotava. It was their first experience of a real Canary Island fiesta and they were charmed by the uninhibited generosity shown by the inhabitants of this northern Tenerife town. From the moment they arrived they were invited to share wine, chick peas, a whole variety of cheeses and balls of gofio. Then a proud old lady let them share the raised position of her front door steps from which to view the procession. the procession swayed and flowed down the cobbled streets like an undulating sea of colour and sound. 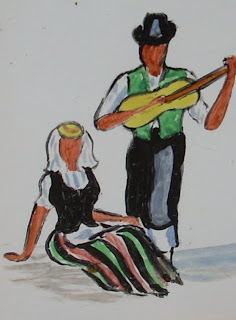 Men in black, fedora hats, white shirts, woollen breeches and scarlet cummerbunds sang and played guitars and percussion instruments, and girls blooming in rich, scarlet waistcoats over gypsy blouses and with striped woven dresses and exquisite petticoats danced merrily around. They followed beautifully adorned carts pulled by massive bullocks and led by strong men who lent against the beasts’ necks to slow them down as they rocked down the steep slopes. However, an unwise decision to take their black English labrador along with them to the fiesta and an encounter with two beautifully behaved drunks led to things getting hilariously out of hand. The romería today is just as attractive and even more popular, perhaps too much so and therefore less “traditional” as modern day needs have turned it into more of a spectacle of colour and merriment than something sacred and religious. But it is, especially in these hard times of economic turmoil, an occasion for everyone to share common bonds, to have tremendous fun and to lose themselves, ever so slightly, in the charms of a good old festive tradition. 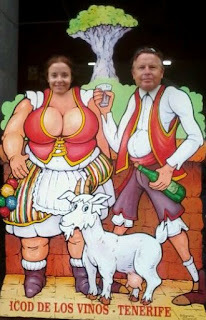 Some, like this odd couple pictured below, might even lose their way entirely after a glass or two of local malmsey and end up in Icod de los Vinos, another delightful Canary Island town and famous for its magnificent "Dragon Tree".